This is the beginning of a series of interviews with people who or whose work is introduced on this blog by me. Moki takes the lead, I wrote about her artwork in the last post. I sent her my questions by email and I was pleased by her cooperativeness and cordiality. Thanks a lot Moki! Do you have children and if yes, do they have a treehouse? Yes, they do have one at my parents place in the countryside. Did you have a treehouse as a child? I built a lot of sheds from all sorts of available materials when I was a child. Clustered moss we stacked up like igloo-building blocks, wooden shacks made from construction site remains like palettes and old boards, huts made from bales of straw, sheds that only consisted of some yarn and soil we scraped open. And treehouses, where I often functioned as a re-user of the buildings of my older siblings. We were also surrounded by a lot of good climbing trees, so very often we would just get up our favorite branch, and enjoy the view from up there. When I visit places of my childhood today, I’m happy to see little carvings in the trees and how they slowly become unreadable with the trees growth. Would you like to have your own treehouse? What would be the ideal spot for the treehouse of your dreams? It would be close to where I live, so I can often go visit it. How high up would it be? Since I’m afraid of heights a little, maybe not at the very top of the tree. In what kind of tree would it be? I imagine a beech tree, just because they were the best climbing trees around at our place. How would you name it? Could you please sketch your treehouse? Can you imagine to you live in your treehouse? I would visit it to be by myself or to be there with a good friend. Is there anything you wouldn’t want to miss in your treehouse? Binoculars, a hiding place for a pocket knife and finds, a basket you can let down on a string. Is there a special someone you would like to invite up to your treehouse and why? I would invite my friends to go on building or just to be there. Can you think of anybody you would refuse access to your treehouse? What band would you like to play music for you on your porch on a friday night? The starling, the blackcap and the blackbird. What would be the perfect treehouse-drink? Selfmade elder juice from a glass bottle. What book would you like to take up to your treehouse? 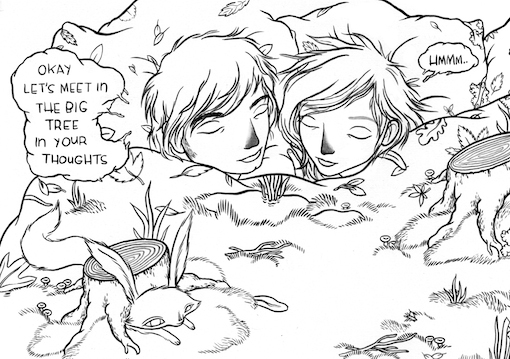 “The Baron in the Trees” by Italo Calvino. Those are books a good friend of mine recommended to me and I can only do so as well! 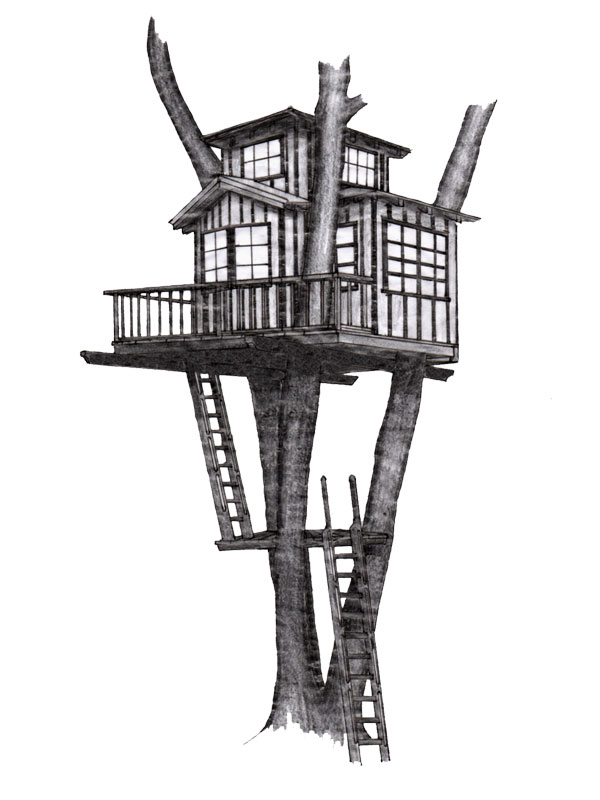 What, in your opinion, does a treehouse stand for? A place where you are safe and secure. A place where you get some distance to the world to reflect.